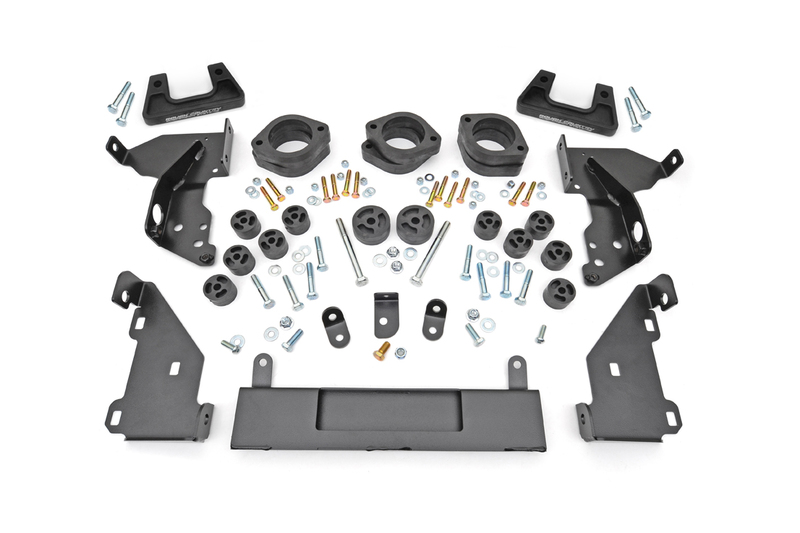 Get the best of both worlds with Rough Country’s 3.75″ Combo Kit for 2014 GM 1500’s! This unique kit combines our popular 2.5″ Leveling Lift Kit with our 1 1/2″ body lift, offering you a big boost at an incredible price! A lift kit for the cost of a leveling kit? Gain enough ride height to run up to 285/75 R 17tires at a fraction of the cost of other kits with Rough Country’s 3.25″ Combo Kit for 2014 GM 1500’s. This unique kit combines our popular 2″ Leveling Spacers and our 1.25″ Body lift, giving your truck a level look with an additional boost for running larger tires. This easy to install kit features a lifetime replacement warranty and is certified FMVSS no. 126 Compliant, proven not to interfere with Electronic Stability Control feature on new model trucks.